Gamlin Whiskey House will make its debut next week on the corner of Euclid and Maryland. The restaurant, occupying the space once filled by Liluma, will offer a vast portfolio of well-known and obscure whiskeys to complement their steak-focused menu. ALMOST HERE! THE ANTICIPATED LULULEMON WILL OPEN IN NOVEMBER. THIS IS ST. LOUIS’ SECOND LOCATION FOR THE POPULAR YOGA RETAILER. The city’s most happening Halloween Celebration is set for October 26. Maryland Ave. will shut down and bring out the best of St. Louis costumes. FALL PRODUCE! Just because the leaves are changing, doesn’t mean you can’t still enjoy the farm fresh goodies! Delicious squash, eggs and meat are still available. Stay in the Scene….Central West End Scene is keeping us up to date on upcoming events & happenings in the neighborhood. CWEscene.com posts daily updates on the best happy hours, specials & events in the area. Thanks to our friends at Laumeier Sculpture Park, the front lawn of the York House has a new presence — the installation today of the Ernest Trova sculpture, Gox No. 9 1975. The York House is committed to enhancing urban living, and we feel this sculpture from one of our own local artists is a great addition. In the late 1960s and early 1970s, Trova was among the most widely acknowledged sculptors working in the United States, resulting in invitations to exhibit in three Whitney Annuals, three Venice Biennales and Documenta 4 (1968) in Kassel, Germany. His works has been exhibited in dozens of major museums including the Museum of Modern Art, New York; and the Walker Art Center, Minneapolis. Gox No. 9 was a gift from the artist to Laumeier Sculpture Park, whose mission is to expand the context of contemporary sculpture beyond the traditional confines of a museum, initiate a lifelong process of cultural awareness, enrich lives, and inspire creative thinking by engaging people in experiences of sculpture and nature simultaneously. We are proud to house this sculpture, and become an extension of the Laumeier Sculpture Park mission. Remember the days before e-mail and texting when neighbors used to spend time talking with each other? Well, we at the York House do, and that concept is one of the origins behind the Library Bar on the ground floor. In addition to enjoying a comfortable, well decorated space to enjoy a cocktail at the end of the day, you can also converse with your neighbors and friends. In a space that evokes the character of the building’s origin in the 1920’s, you may ask yourself, “who else enjoyed a nice conversation over a drink here?” The bar features custom cherry wood cabinets, leather chairs, a refurbished oak bar, and private wood cubbies to keep your own private stash secure and handy. The bar is not open to the public; just residents and their invited guests. The library bar is another way we hope to enhance urban living for our residents. York House residents benefit from a card that gives them discounts at all Maryland Plaza shops right around the corner. Discounts include 20% off at Scape Bistro and Crepes, etc.. This is just another gesture to make our residents lives easier, promoting a 24/7 urban lifestyle that allows you to leave the car behind. 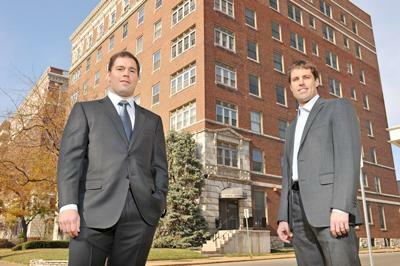 We have reached a huge milestone at the York House in St. Louis. Some tenants have already moved in, and the rest of our luxury apartment units will be ready for occupancy within a month. Call now to schedule a tour of one of our select remaining residences. 314-361-YORK. Spacious bedrooms with plaster crown moulding and dynamic light fixtures are a signature at the York House. Seen here is a 15′ x 18′ guest bedroom in a two-bedroom unit. A view into a South corner kitchen. Marble backsplashes, Caesarstone countertops, white cabinets with slow close drawers and rain glass, and high-end stainless steel appliances are standard in all York House apartments. Photo of a ~20′ x ~30′ pre-war living room with 9′-6″ high ceilings, red oak flooring, and a fireplace (now gas). The fence is down now, but here is a photo looking down at the front landscaping of The York House Apartments in St. Louis, Missouri. Since 1948, Straubs has been serving the Central West End from its location right next door to the Chase Park Plaza. Straubs features an award winning, full service meat department, a full service deli, and the highest quality seafood flown in daily. Straubs has all of the fresh produce and other items you would find at your everyday supermarket, plus friendly service and familiar faces that make normal grocery trips something to really enjoy. Straubs is open 7 days a week and is located only 100 steps from the York House.